The 30 hectare dam is situated in the southern corner of the farm and is fed by three mountain streams. Two enter the dam from the Okhahlambe Park. These two have created channels that run some distance into the dam and these areas consistently deliver good fishing. The third enters at the top of the dam into shallows that also consistently deliver good fish. The rivers that feed the dam do not run through any agricultural lands. 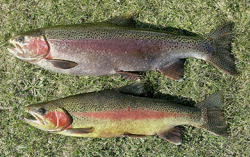 The dam is well stocked with 4" Rainbow and Brown trout at the end of every summer. These fish have been grown out in a hatchery on the farm. 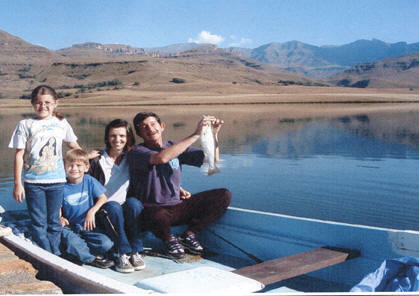 This hatchery has been in operation since 2005 and many dams in the Underberg district stock Crystal Waters Stockies. Float tubes and kick boats with sneakers are welcome. There are two boats for the exclusive use of the cottages and guest's boats are also welcome. Outboard motors are not allowed. 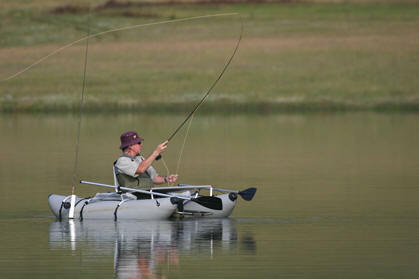 There is a rod limit of 10 fisherman on the dam at any one time which ensures an undisturbed days fishing. 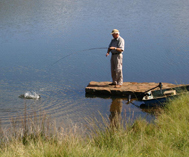 The dam can be fished from the sloping grassed sides in many places and from the jetty in front of the cottages.